The Piranha Plant DLC for Super Smash Bros. Ultimate early adopters will release next month. Confirmed via Nintendo News feed on Switch, players only have until January 31 to pick up the game. From there, they will receive a code for the character, otherwise they will need to purchase it at a later date. An exact date hasn’t been pinned down yet, but we do know that it will be sold seperately at a later date, outside of the game’s Fighters Pass which contains five new fighters for the game. In December, it was confirmed that Joker from Persona 5 would be joining Super Smash Bros. Ultimate as the first combatant in the Fighters Pass. Dataminers have apparently uncovered details on the remaining fighters, but it remains to be seen whether those reports are accurate. 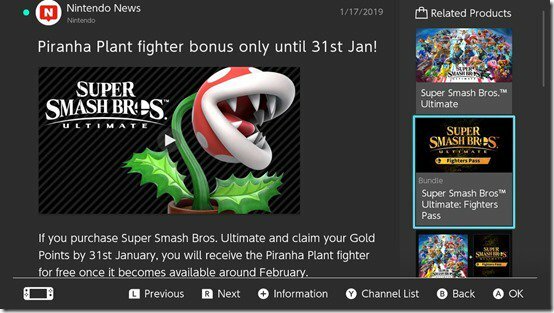 Piranha Plant DLC will be released as an update for the Super Smash Bros Ultimate sometime next month.